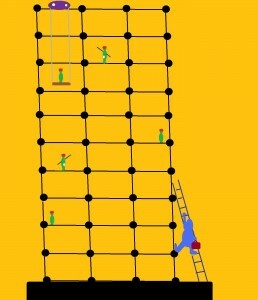 LATTICES, NOT LADDERS: “Companies are increasingly supporting more natural growth, letting employees wend their way upward like climbing vines. It’s a shift, in other words, from a corporate ladder to the career-path metaphor long preferred by Deloitte vice chair Cathy Benko: a lattice. …At Deloitte, each employee’s lattice is nailed together during twice-a-year evaluations focused not just on career targets but also on larger life goals. An employee can request to do more or less travel or client service, say, or to move laterally into a new role — changes that may or may not come with a pay cut.” (“We’re Getting Off the Ladder”, Laura Fitzpatrick, online Time Magazine, May 14, 2009). Analysis: Recruiters will have to reapportion the relative weights assigned to dangling the prospect of promotion versus offering flexible career paths featuring blends of horizontal as well as vertical moves, much like the trajectory of a construction worker moving across, up and down the beams of an office tower under construction, in order to get the job done. Hence, building a career is becoming more like building a building: both are going to require a lot of lateral as well as vertical moves. Ideally, this will not only increasingly become a necessity for the employer, but also a goal of the job-seeker and employee, if the recent PwC prediction of a sizable shift in preferences in some workplaces toward favoring that work styleis correct. Analysis: This may mean a diminished role for some in-house HR recruiters to the extent that start-ups won’t or can’t budget for and use a professional recruiter of any kind, or it may mean a possibly growing niche market for some independent recruiters, e.g., www.startupers.com/headhunters, which features a list of more than 80 “StartuPers Recruiters” (for some reason, not spelled “StartUppers”), with an understandably heavy California weighting; www.recruiterbox.com, a provider of “out-of-the-box” recruitment services; and www.peopleconnectstaffing.com, to name but several. On the other hand, there is the argument that the more important recruitment niches are the traditional ones of geographical region or market sector, such as Silicon Valley or software engineering. Accordingly, such conventional-niche focused recruiters are more likely to be concerned about losing market share in these latter core niches by switching to start-up recruitment—regarding re-focusing on the latter as a bad trade, despite fewer niche competitors. Obviously, in the event of a “perfect storm” that brings together clusters of start-ups in a concentrated geographical Silicon Valleyesque start-up zone, the venture recruiter concept may have significantly greater traction. The StartuPers Recruiters site, for example, seems to have its crow’s-nest spyglass on the lookout for precisely such brewing storms, given the proximity to Silicon Valley of many of its listed recruiters. As for a comparison with the PwC report, the latter would have to situate such small start-up companies well outside its neo-feudal Blue World scenario of traditional big corporations, most probably in its commune-like Green World of idealists among whom there are those with big dreams, but small companies, rather than in the free-lancer Orange World of independent “guild” specialists and experts. MORE BANG FROM THE BABY BOOM: “Investment firm T. Rowe Price calculates that the oldest boomers will have to delay retirement by nearly nine years in order to recover what they lost in the market. The somewhat good news is that if they defer Social Security and save 25% of their salary, they can reach their golden years in half the time.” (“Why Boomers Can’t Quit”, Stephen Gandel, online Time Magazine, May 14, 2009. Analysis: This is an additional variable beyond pure seniors’ population numbers that will drive the expansion of the supply of older workers. Given that many of them will have some assured financial resources, e.g., pensions, portfolio dividends and/or home equity mortgages, to the extent that they nonetheless wish to or must work, the odds are that older workers will be willing to do a job for less, if their income target is modest. The numbers of older workers alone does not define the supply of them. Obviously, supply is defined by the numbers of them willing, needing and/or wanting to work. This desire to work, combined with a target of comparatively fewer total hours, lower total supplemental income or lower hourly income/salary, is almost certain to exert downward pressure on some industry wages and upward pressure on younger workers to competitively offset the experience and expertise arrows in the more seasoned senior workers’ quivers—not to mention the need to offset savings to companies that each part-time semi-retired worker represents in terms of scaled-back or non-existent benefits packages. The impact of the baby-boomers lingering presence in the job market may be comparatively less than dramatic or may even be negligible, if real adjusted wages and income actually decline or at least stagnate more because of recessionary forces, e.g., related to slumping demand, dollar depreciation or outsourced competition, rather than to increases in lower-wage baby-boomer supply. Likewise, to the extent that the older workers’ supplemental income and associated expenditures translate into an increase in consumer demand, the counter-inflationary effect of decreased cost-push inflation in the form of lower wages could be offset to some degree by whatever demand-pull inflation that senior spending generates. For its part, the PwC report once mentions, but does not directly address the trends and implications of an aging workforce. PATCHING HOLES IN END-OF-CAREER PARACHUTES: “Retiree health care is getting whacked hardest — just when the boomer generation needs it most. Of the employers surveyed, 45% have already reduced or eliminated subsidized health-care coverage for future retirees, and an additional 24% are planning to do so or considering it. Of those offering the perk, roughly 25% put a dollar cap on how much they will spend per retiree. ‘Once the cap is reached, future inflation risk transfers to the retiree,’ notes Ron Fontanetta, an executive with Towers Perrin.” (“The Search for the Next Perks”, John Curan, onlineTime Magazine, May 14, 2009). Analysis: This reinforces the argument that older workers nearing retirement age will have to supplement their resources with at least part-time work, in order to patch their retirement parachutes by recovering some of the losses incurred during the economic meltdown of 2008 and its aftermath, and to pay out-of-the-pocket health care expenses no longer covered by traditional company policies and insurance plans. For recruiters this means gearing up to increasingly hearing from older workers and to pitching them to a company. Again, apart from the suggestion of a kind retiree protection in the form of graduation-to-grave paternalism of the Blue World corporation, the PwC report does not develop any scenarios for older workers, viz., in the Green and Orange worlds. THE GROWING COSTS OF SHIPPING OUT AND ACROSS: “After an initial surge of enthusiasm for shipping jobs of all kinds to low-wage countries, many U.S. companies are making a distinction between exportable jobs and jobs that should stay home…According to Clemson University’s Aleda Roth, who studies quality control in global supply chains, the successful companies of coming years will be the ones that make product safety — not just price — a ‘big factor in their decisions about where to locate jobs’…The cost of shipping foreign-made goods to the U.S. market will begin to offset overseas wage advantages. We saw that last year when oil prices zoomed toward $200 per barrel.” (“Yes, We’ll Still Make Stuff”, David Von Drehle, onlineTime Magazine, May 14, 2009). Analysis: Clearly, rising energy costs may, on the one hand, motivate companies to “outsource” conventional onsite employment to the employee’s home, through telecommuting, which will reduce commuting costs, office energy expenditures, etc., while on the other, the rising energy tab may repatriate business to the homeland as distribution and shipping energy savings offset lower overseas production costs. One implication for recruiters is that on both sides of the job placement deal—applicant and client, there should be increasing receptivity to telecommuting and other forms of remote employment. Even though the recent PwC report on the future of work and the workplace suggests a growing expectation of traditional office-based 9-to-5 traditional in big corporation Blue World employment by 2020 (Note: 75% of the thousands of PwC incoming employees surveyed expect traditional working hours onsite. ), PwC does foresee precisely the aforementioned kind of energy conservation-driven telecommuting and more efficient corporation-sponsored or subsidized transportation in at least its Green World scenario. A second implication of the “closer to home” Time Magazine model is that clients with a quality-control or strategic edge over overseas low-budget competitors should be monitored by recruiters for job and performance growth. For example, the outsourcing of the task of assuring a supply of rare earth elements, primarily to China as the main source, seriously impacted by China’s recent reduction in its REE export quotas, means that strategic industrial and military considerations, apart from any quality issues, will make REE mining and manufacturing companies that are closer to home increasingly important in the marketplace, and by extension, in the job marketplace (which is why, I should disclose, I am a stakeholder in one such REE company). A full read of both the Time Magazine and PwC reports will facilitate a fuller comparison of not only the two perspectives and their points of convergence and divergence, but also of then, 2009, and now, 2011.